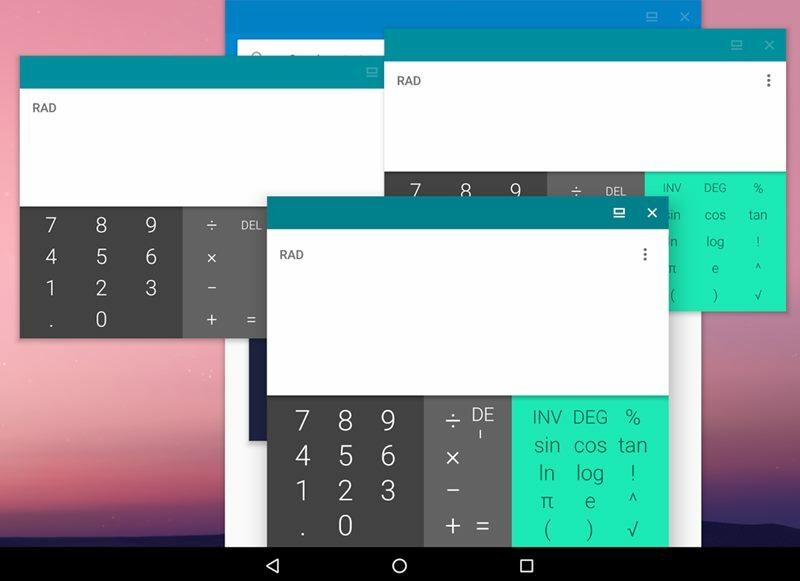 Now you can quickly run the Same App in Multiple Windows on Android Nougat by using the simple trick that will help you to run multiple aspects of the same app in a single screen. So follow the below tutorial to proceed. Android Nougat that is the newest version of the Android released by the Google last time have an infinite number of chunky features those all could totally impress the users with their functionality and hence give them the real experience of using the device. One of the coolest features that this release of the Android version is integrating inside is the ability to run up the two windows of the OS side by side on the single screen making it much easier for the users to work on those two different windows while working on same apps. This feature isn’t although the first to be seen ever but was also available before on some devices, most of that have restrictions for multiple apps that could not be used in the dual windows. Moreover, this feature is great and there is only need for the new users to learn it up. Here in this article, we have discussed the method through which you could be strong run the same App in multiple windows on the Android Nougat running device and hence do up the various processes at the right time. If you also wish to run any of your apps like WhatsApp, Facebook, etc. in the multiple Windows on your Android Nougat device, then you must read up on this article and hence know about the method for doing so. Now you just go and read up the method now! The method is quite straightforward and easy, and you just need to follow step by step guide below to proceed. 1. 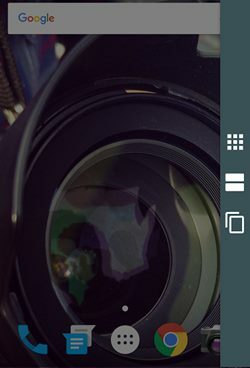 First of all, install the Parallel Windows free app on your Android device, but note that this app is in the beta stage and might contain some issues. The Android Nougat version only supports it and it, won’t work on any other Android device running alternate version. This app could be found in the Google Play store so you would not need to look for it here and there! 2. Now after you have installed up to the app on your device just run it up. The very first interface screen of the app that you would see is the information that requires being accepted; this could be done by checking the box saying “I have read and understood” and then tapping on the continue button. 3. On the another screen that appears after the above step inside the app you need to grant two more permissions by toggling these. On toggling the first permission, you would see the apps list from where you need to set up all those apps that could access that specified permission. 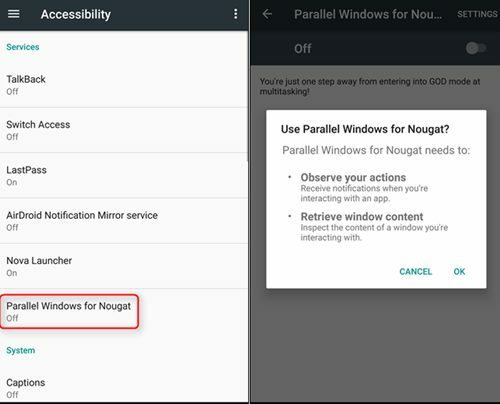 On toggling the other option, you would be taken to the Accessibility screen from where you need to enable the Parallel Windows for Nougat option. 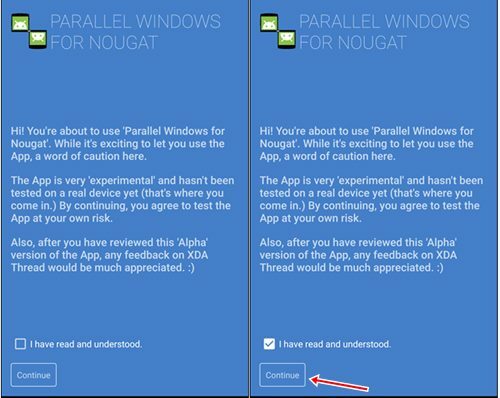 These are required to get up the full experience of parallel windows feature on your device so you must grant both of these.After doing do move to the further steps of this method. 4. 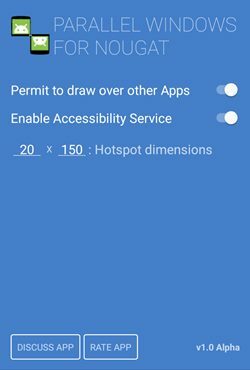 Now on the app screen, you need to set up the Hotspot Dimensions from which you would be able to slide the Parallel Windows Menu. By default, it is set to the middle right side of the screen, but you could also customize it by your wish. Now after setting all the above settings, you are all established to start using the Parallel Windows. 5. To start up a slide from the Hotspot Dimension on your Android screen out of the app which is closed, this would launch up the Parallel Windows Menu. 6. Use up the App drawer option from the menu and then select up the app that you wish to use in Multi-Window on your device, now use up the another option from the list that would start up the multi-window session. And this would automatically open it up in Multiple Windows. The third option of the Parallel Windows menu could be accessed to mirror up to the apps in multi-windows on your Device! After reading up the above article, you have got about all the first steps or the method to make your Android Nougat device run up the same apps for multiple times in the different windows like it is done in virtual environments on the computer systems. This could be highly beneficial to work on any different interface of any single app and hence make up the task more fluid and verbal. Hope that you liked up the article and found up the method from this section to be useful to you. If you are getting any issues applying the method or any other problem related to the steps, then please comment for that, we would love to help you out!